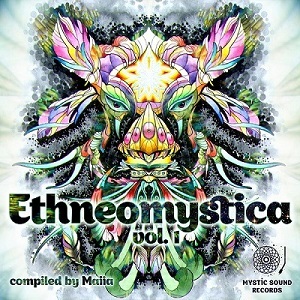 Mystic Sound Records proudly presents the first chapter of the brand new series of compilations: Ethneomystica! Welcome to the world of Ethneomystica with its mystical psychedelic sounds interwoven with traces of ethnic music traditions. We invite you to take a wonderful journey through deep, groovy psy dub and psybreaks through to melodic psychedelic downtempo and chill accompanied by several masters of the genre: Chronos, Slackbaba, Globular, Radioactive Sandwich, Vlastur & JP Illusion, ManMadeMan, Yggdrasil, Maiia, Mahaon, Naturelement, and Yechidah. Every track is brilliant and the whole compilation is a real treasure that will definitely decorate your collection. Take a deep breath and dive into an unforgettable psychedelic experience! Mastered by Edward Cybered at Manifold Mastering Studio with artwork by Art Group Line and cover design by Elena Ukolova. MP3 Download | FLAC Download | WAV Download · Download count: 24,492. Mmmmmm, the track 1 is too simple to be in this album, all others are really good, and as always Globular incredible. Lot’s of delicious sounds from great artists all packed in this excellent compilation! Everyone should have this in their music library, Thumbs up!!! Wow this is really good! very awesome compilation! Thanks for these awesome sounds! The best Psydub I have heard on this site. Right up there with Electrocado. Excellent and pure. Pink Glasses is my favorite track! Very nice compilation! R.A. Sandwich, Globular & Slackbaba are my favorites! thumbs up! Where to take a carpet? Only one of the most amazing psybient psydub collection I’ve heard in the past months ! Amazing psybient dub. Big thanks to the artists and, of course, Ektoplazm!